Physical Evaluation Numbering System was developed by hobbiests to encourage a unified system when describing an items originality and use. It is healthy for the industry to encourage the public to get involved with understanding what they are buying. We need to take control of our purchases and start engaging in evaluations ourselves. Certainly, it is useful when we have knowledgeable people evaluating game use, provenance, and originality of an item. There is no way to take out “opinions” of this type authentication process nor to erase personal bias. PENS has come up with a numbering system that aids the buyer in determining whether or not they want to purchase the item themselves based on the unified numbering system eliminating bias and recording facts as seen by the Evaluator. Collectors can use this guide, or a professional Evaluator will be assigned to assist in filling out the guide. This evaluation is determined by one of our Experts. It is designed to eliminate opinion and rather notate facts as assessed by the evaluator, and then recorded by the PENS numbering system. Examples: Cut Sleaves, Cut Tail, Cut Collar, etc. 100% Guarantee. We will issue refunds on items that have been legally found to be fraudulent, or unauthentic. We are here to offer Customer Service to our clients and returns will be accepted under certain conditions. In our 20 years of experience we have not had any issues. Items are sold with the authentication as described and will not be refunded for differing authentication opinions. We accept and use the following companies and authenticators. 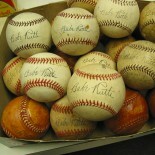 BidAMI.com LLC or 100PercentAuthentic.com authentication involves individual judgment that is subjective requiring the exercise of professional opinions. These professional opinions include the above mentioned companies. Therefore, no warranty or representation is made and BidAMI.com LLC or 100PercentAuthentic.com company shall have no liability whatsoever to the customer for the opinion rendered.